Kim Kardashian attends What Goes Around Comes Around 25th Anniversary Auction Beverly Hills Preview, presented by Christie's, at What Goes Around Comes Around on August 21, 2018 in Beverly Hills, California. Kim Kardashian accentuated her pout with a swipe of gloss. Kim Kardashian showed off a super sleek lob at the Christie's x What Goes Around Comes Around 25th anniversary auction preview. 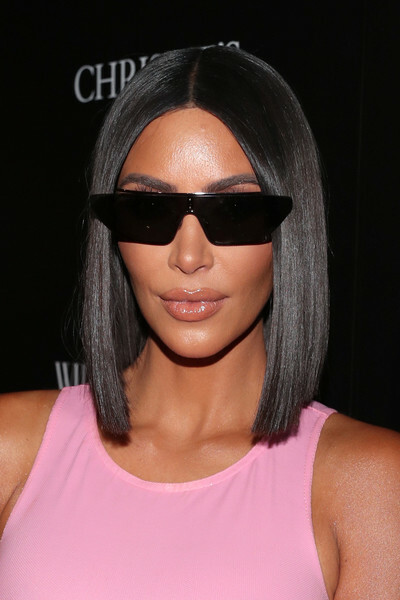 Kim Kardashian amped up the modern vibe with a pair of blade sunglasses.